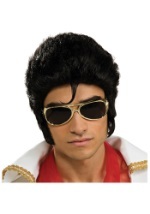 You'll be the hippest Elvis impersonator with this fun King of Rock and Roll wig! This wig features black synthetic hair and is styled in Elvis's famous hairdo and sideburns. The interior has a mesh netting for a comfortable fit. Add this to any of our Elvis costumes for a look straight out of Graceland!